Spring is finally here and do you know what that means? It means that farmers' markets and farm stands will soon be reopening. Our local farmers' market opens in May and I can’t wait. Some of you in warmer regions may have access to them sooner (lucky). To be honest, in the 5.5 years that we have lived here I’ve only visited our farmers' market a handful of times. There’s no excuse, its less than 3 miles away. So one of my Green Goals for 2009 was to go regularly. Fresher produce. On average, US grown produce is picked 4 to 7 days before it gets to the supermarket and shipped an average of 1500 miles. Where as at a farmers’ market, most of the produce is picked within 24 hours. More nutrients. 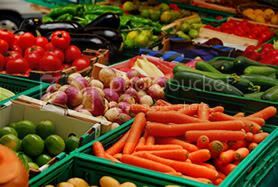 Fresh produce lose their nutrients rather quickly. Local food that is purchased soon after harvest will have more nutrients than the food that was shipped hundreds of miles and then sat on a shelf for 2 days. Avoid GMOs. Local farmers do not have access to genetically modified seed, and most of them wouldn’t use it even if they could. Know what you are eating. You can talk with the farmers about their practices to find out how they grow their food. Support small farms. Local farmers who sell directly to consumers get retail price for their food which allows them to keep running their farm. In turn, this also preserves open space. If their farm is doing well then they will not be selling their land to developers. Where can you find locally grown produce? If you have an independent grocery store near by check it out. Often times they will carry food from local farms. Visit you local farm stands and farmers' markets. Farmers' markets are great because you often have several "vendors" offering a variety of products. At ours they have the obvious fruits and vegetables but then their are also vendors with locally made honey and maple syrup. You can also join a CSA (Community Supported Agriculture). A CSA allows you to purchase a share in the farm where you usually receive a weekly basket of produce. I really want to join the organic CSA in our town, but there is about a 3 year wait. So we added our names to the list last year. To find a farmers' market, farm stand or CSA near you, visit www.localharvest.org and enter your zip code. that's the great thing about Costa Rica, there are a bunch of local farmer's markets, all grown close to where i live and they are dirt cheap. but they aren't organic. We've joined a CSA this year for the first time after debating it for a while. I'm looking forward to it! Oh you have to let me know how you like it. I so badly want to get in on the one here. Thanks for the info. I am excited to check out some farmer's markets near us. I mean, I really need to. I always tell my husband we should and then we get lazy. You've convinced me!